The MEV Innovation Centre will be closed on Monday, August 6, 2018 to observe the Civic Holiday. We will be back at 8:30 am on Tuesday, August 7. If there’s one thing we all share, it’s curiosity for what other people are doing! The MEV Innovation Centre is first and foremost a place for business people to meet. Designed for new and existing business in a growth phase, the innovation centre provides an ecosystem for technology intensive companies and business in the manufacturing and production industries. Bringing entrepreneurs and services together, core features of the centre include: collaborative space; business services; business acceleration/incubation; education and training. Staff are now at the centre and available to welcome guests Monday to Friday, 8:30 a.m. to 4:30 p.m. To schedule a viewing, please contact us in advance. The MEV Innovation Centre is now also booking event space and taking requests for Board Room use, Co-Working and Office Space. Early adopters include the Halton Region Small Business Centre, HalTech, Silicon Halton, Milton Chamber of Commerce, Milton Young Professionals, Milton Code Retreat (Meetup Group), along with additional business community leaders. This project is developed in partnership with the Town of Milton and Wilfrid Laurier University. Subscribe to our blog to receive the most recent updates. The rates schedule and criteria for access will be posted in March 2014. To view the centre, call the MEV Innovation Centre at 905-636-6505 or email MEVInnovation@milton.ca for more information. 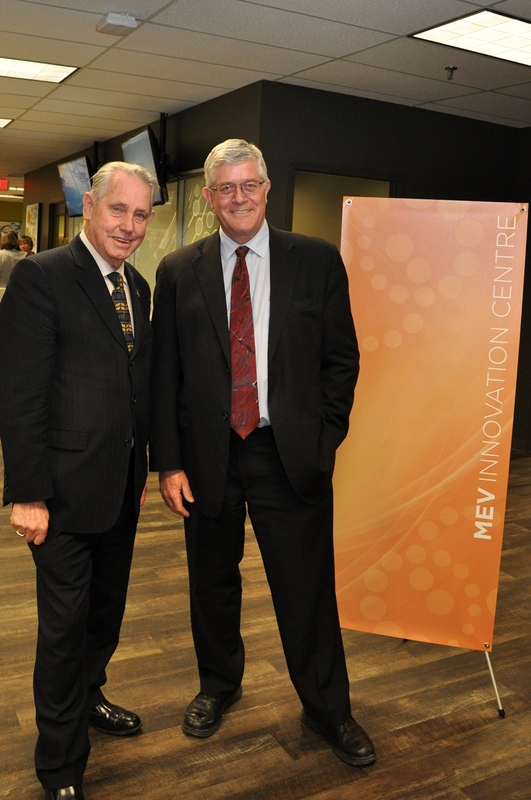 On November 28, 2013 we celebrated a soft launch of the MEV Innovation Centre with community partners, providing a sneak peek of the new facility that is slated to open in early 2014. Joined by the Town of Milton and Wilfrid Laurier University as the lead strategic partners, the community is bright with genuine enthusiasm for the innovation centre and the role of Laurier with future education and training opportunities. 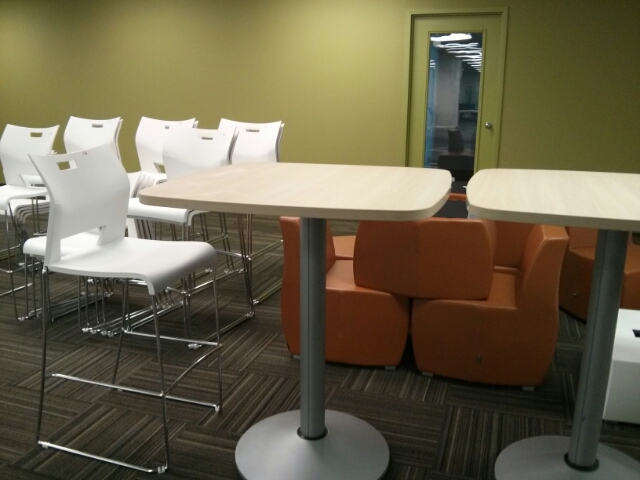 We’ve posted a few pictures of the completed renovation (Phase 1, that is), and some shots of guests networking. Interest is high, and we’ve already booked several business-to-business networking events. In fact, on December 3, the Small Business Centre hosted 25 entrepreneurs who were engaged with Steve Farlow, Executive Director, Schlegel Centre for Entrepreneurship, Wilfrid Laurier University. The event featured the importance of networking, followed by a speed networking session. The MEV Innovation Centre will be open early 2014 and is now booking business networking events and board room meetings. More details will follow on criteria for tenants. Innovation is what happens when we consider multiple disciplines in a non-traditional way. It is truly a preferred position to be in, when the synergies of post-secondary, business and government sectors intersect. Laurier’s commitment to the Milton Education Village (MEV) is well known in the local community and beyond. A Memorandum of Understanding has been in place between Laurier and the Town of Milton since 2008 that enables the university to explore the possibility of establishing a university campus on a 150-acre site within the MEV. Laurier’s strength as a multi-campus university was brought to the forefront with its pre-budget submission to the Province of Ontario in September 2012, highlighting its relationship to Milton and its plans to meet demand for university access in the Greater Toronto Area. The MEV partnership program, signed in 2011, also included the invitation to Sheridan College to become a partner in the MEV. The innovation centre will meet demand arising from the shift towards a knowledge-based economy. Laurier is already providing learning experiences to the community through the Laurier Milton Lecture Series, which is currently in its fifth season. Now, Laurier’s commitment to the innovation centre will strengthen Milton’s evolutionary path that continues to embrace a culture of innovation and creativity. Well, there’s no going back – only forward. As renovations at the MEV Innovation Centre get underway, it’s interesting to observe that when one replaces an old item with a new item, it leads to a series of everything becoming new. Somehow, what once was simply won’t do anymore. Looking in the rear view mirror, we see what was a dated building is now one with the ceiling removed and replaced, the old flooring is out and the new is on order, and the fresh paint is already being applied. And, what a difference these few steps already make! As we focus on the future, we see that Milton is offering an alternative to employment growth that better positions Milton to capture office demand to match the local talent pool. The MEV and the MEV Innovation Centre are two development types which, in combination, will be complementary and provide a place for the business community to self-identify, to foster a business ecosystem, and ultimately facilitate an evolution or sophistication in employment diversity and demand for office use. Diversity within the employment base, including office uses, becomes increasing important for comprehensive planning and implementation of the future MEV and Derry Green Business Park. So, what’s so innovative about this innovation centre? The innovation centre concept is well established and a widely accepted model within economic development strategy. The innovative part is not the building per se, but rather the outcome of the ideas and businesses which happen as a result of entrepreneurial people coming together in a collaborative work space environment. The support system provides access to resources, mentoring, networking, education and training, which greatly improve Milton’s path to success. What’s the Town’s role in the innovation centre? Through the Economic Development function, the Town is leading the partnership among government, business and the private sector, along with community stakeholders, to be a catalyst and build on momentum for our citizens who represent the idiom ‘Knowledge Lives Here’. We can’t wait to see what adventures lay ahead as we build our road to the future, and let the knowledge that lives here come together in a collaborative work environment, to generate ideas, innovate and make business happen. Milton is Canada’s fastest growing urban community and among the most talented in North America, with three quarters of our work-aged population having obtained post-secondary education. Much of Milton’s fabric is made up of young, educated, entrepreneurial individuals, the bulk of whom are between 25 and 44 years old, speaking 85 different languages across our global village. We have energy and ideas, and yes, we are proud to boast that five families move into Milton each day! We have vision, a plan for Milton, as we move from concept to implementation in our newest venture – the Milton Education Village Innovation Centre. The Milton Education Village (MEV) is envisioned to be a 400-acre (160 hectare) comprehensively planned neighbourhood, integrating post-secondary education, residential, commercial and recreational uses, alongside a biosphere reserve – the Niagara Escarpment. Plans for the MEV include an innovation centre, a local initiative dedicated to enabling an entrepreneurial culture for business start-up, incubation, intersection for innovation, education and training. Like a ‘base camp’ for much bigger things to come, we are building a transitional space for the innovation centre at 555 Industrial Drive as an early experience to the MEV. This is a beginning, an early step towards building a place for knowledge to gather, collaborate and to define ourselves in growth. The future is bright; join us in the making of the innovation centre for Milton. More details to be added, as we move from concept to implementation with an open house announcement this fall. The intake process, including applications for business in residence, will begin in 2014.